Our raw gameplay video from Red Dead Online. 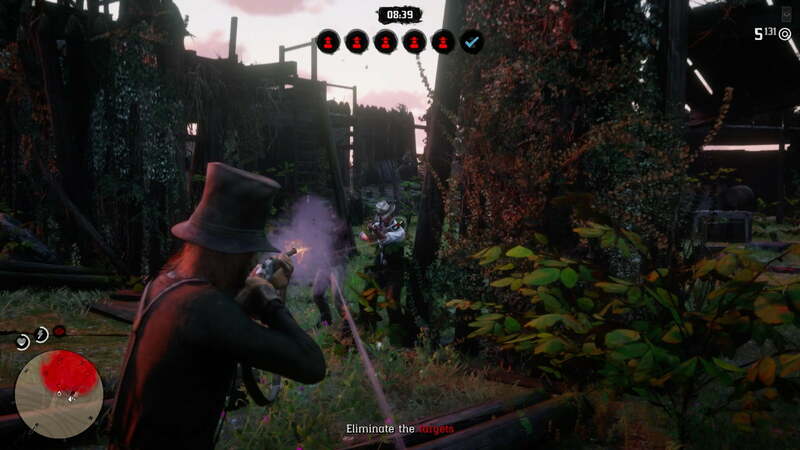 Red Dead Online, the multiplayer component of Red Dead Redemption 2, takes cues from both the original game’s online mode and Grand Theft Auto Online, but it winds up forming an identity of its own. So far, at least. After spending several hours with the Red Dead Online beta, I can see how the experience could expand and evolve to hold the attention of cowboys and cowgirls for the long haul. As it stands, Red Dead Online is more of an appetizer than a main course. But it’s a mighty delightful appetizer. With a surprisingly engaging story that strikes a balance between chaos and calm, and a mix of single player, cooperative, and competitive activities, Red Dead Online has a broad, sturdy foundation. 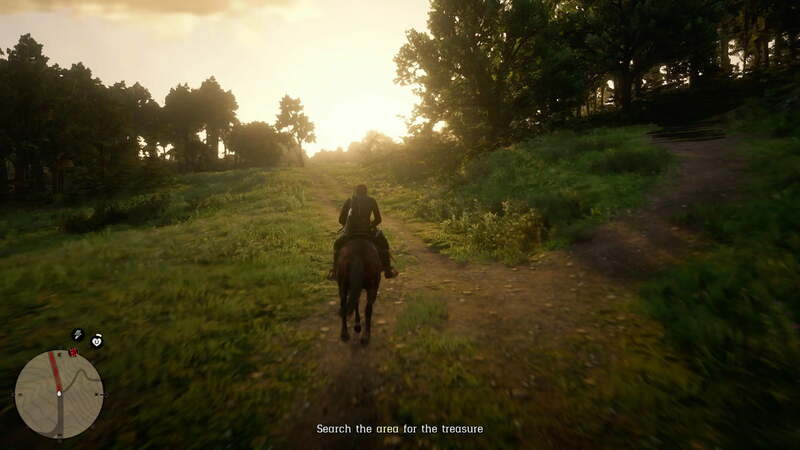 In the main adventure, the map serviced the story created by Rockstar, starring Arthur Morgan and the Van der Linde gang. In Red Dead Online, that same world largely belongs to you. You enter Red Dead Online as an incoming prisoner of Sisika Penitentiary. To prepare for your mugshot, you create your character. Much like GTA Online, it’s hard to create an individual that isn’t, well, extremely less than attractive. It’s quite strange, actually, since the customization tools are fairly in-depth for facial features. Perhaps Rockstar wants your character to be ugly since they’ll partake in many unsavory activities. Either way, after a few hours I mostly forgot that my bargain bin version of John Marston looked like he was going on 60 at the age of 27. After you put the finishing touches on your Frankenstein, the narrative begins. While being transferred from the prison in a caravan by two armed guards, a group of men free you and your fellow inmates. They let the other inmates run free, but ask you to tag along. Soon you meet Jessica LeClerk, a woman who asks you to kill the men who murdered her husband. She freed you after all, and even though you were wrongly convicted of unknown crimes, your character obviously feels like they owe LeClerk their life. The cutscenes and writing are predictably polished just like the main game, and they seamlessly weave in and out of the gameplay. The one major downside of the narrative beats, however, is that your character is an empty vessel who never utters a word. Instead, most cutscenes show your creation either nodding or just staring blankly at the speaker. It takes you out of the story a bit, but it’s understandable why your created character wouldn’t have dialogue in an evolving online mode. Your sole form of communication with NPCs come through emotes, such as nodding your head or holding up finger guns like a hip dad. Red Dead Online supports up to 32 players on a server, though in my brief time playing it, I ran into exactly three human players. One of them shot me in the head on sight. After that (not so) shocker, I shot the next player I saw off their horse immediately and then trampled them. Competitive multiplayer actually feels like the most fleshed out aspect of Red Dead Online. Feeling bad for my actions, I decided that I would try a more peaceful approach the next time I encountered someone. 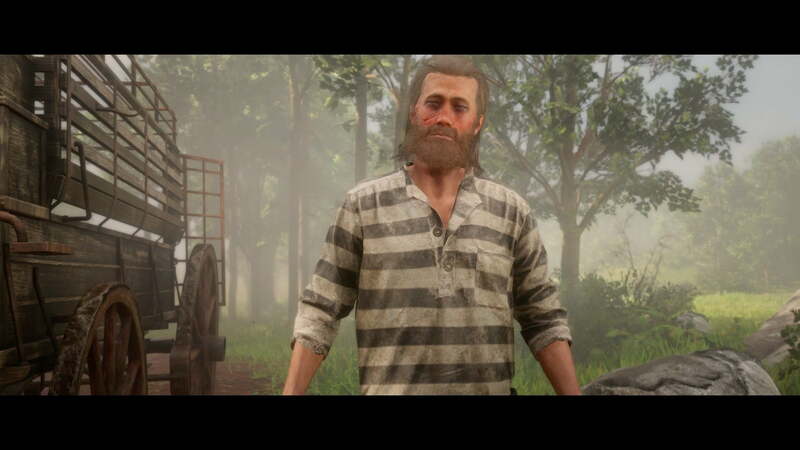 I figured I’d get shot dead before I could nod my head in greeting, but, remarkably, my fellow outlaw returned the gesture, and we both went our separate ways. 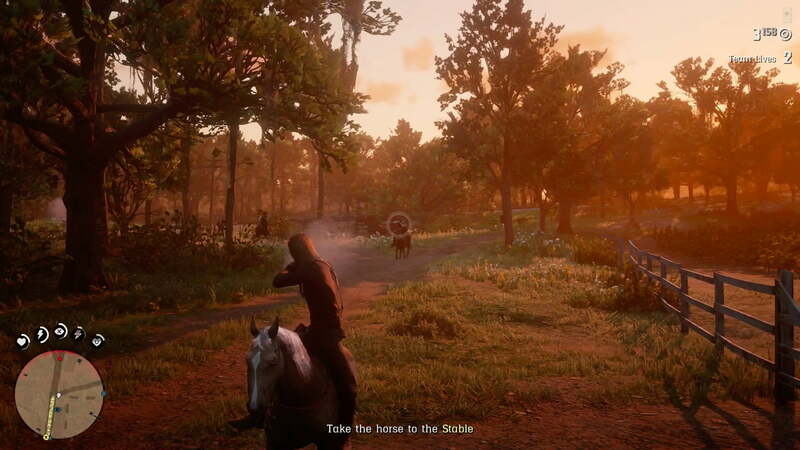 Of course, I’m not naive enough to believe these serene interactions will be commonplace in Red Dead Online. The structure of some of the objectives themselves basically begs for interruption from nefarious players. Throughout the map are stranger icons where you can pick up missions to play solo or with friends. The missions include bounties, kidnapping people from stagecoaches, taking down hideouts, and even humdrum tasks like delivering mail. But since you aren’t alone in this world, others on the server can steal your bounty or your mail, kill you and then take credit for your hard work. One of these disruptions hasn’t happened to me yet, but as players get familiar with the tasks, I imagine it will happen a lot, thus forcing you to band together with friends. 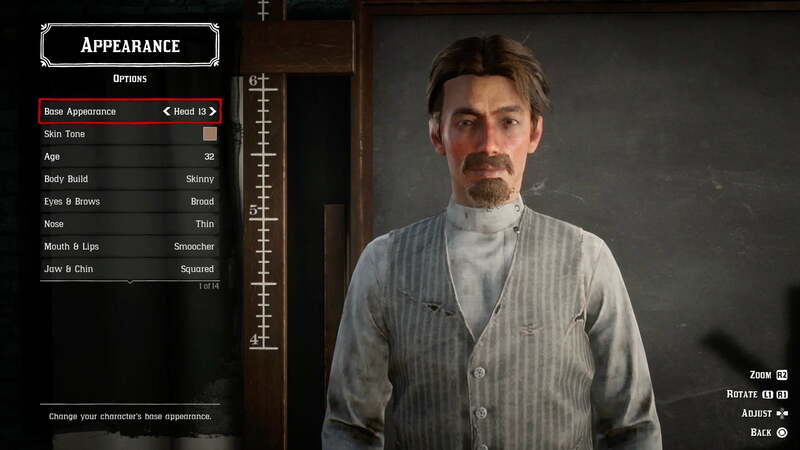 Although Red Dead Online has the Honor system that reflects how you behave in its world, it will probably take some time before we start to see true consequences for your actions. The main story missions are completed cooperatively with three other players. Once you accept a mission, you’ll see all four characters in the ensuing cutscene, which is a nice touch. I played a few of these so far, both of which went smoothly. The only mission that required actual teamwork tasked three of us with protecting the other player. Otherwise, so far, everyone pretty much has to just hold their own, with little to no communication required. 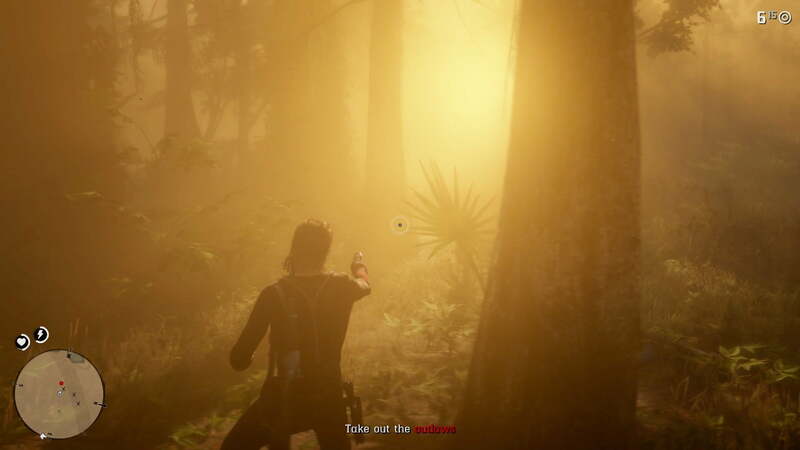 After you complete a mission, you’re dropped back into free roam, where you can choose your next activity. Along with the open world format, you can enter competitive multiplayer from destinations on the map or in the menu. Dubbed “Showdown Series,” there are five multiplayer variants that take place in pre-determined spots on the map. A solid gun costs a couple hundred or more. Is that a problem? It could be in the future, but I can’t say for sure right now. The competitive multiplayer actually feels like the most fleshed out aspect of Red Dead Online. Each of the modes is fun and offers something different. There’s standard deathmatch, a mode that rewards more points if you kill the leader, and one that allocates points based on the weapon you use for the kill. In the latter, I experienced my most riveting moment in Red Dead Online so far. Down two points with less than five seconds left, I switched to a shotgun that awarded three points a kill. I happened to run into a doorway just as an enemy was running out. One blast to the chest in the closing seconds earned my team a victory. Red Dead Online also has its own spin on battle royale called “Make it Count.” Here, you are either armed with a bow and several arrows or six throwing knives. That’s it. The playable area gradually shrinks, and you have to balance going for kills and saving your tools for the homestretch. I ran out of knives when I made it to the final two and predictably lost because of it. The downside of multiplayer is that you cannot pick the variant. You can, however, choose if you want to play with up to 16 players or up to 32. I found each of the multiplayer formats to be fun, though, so I wasn’t bothered by the lack of choice. Since Red Dead Online has a limited number of designed activities at the moment, it’s hard to pay too much attention to the rank and rewards systems. Here’s the rub: You earn very little money for completing missions. Two hours in, I had about forty bucks. A solid gun costs a couple hundred or more. Is that a problem? It could be in the future, but I can’t say for sure right now. As it stands, I felt no real need to worry about my rank, upgrades, buying new weapons, or upgrading my camp. It is clear, though, that the gold bar system will be a major grind in its current format. Gold bars, which will eventually be available as microtransactions, take a very long time to earn naturally. I don’t think this is really a problem, considering gold bars are only set to unlock cosmetic items. All that said, the rank and customization system seems to have a lot going for it if it scales appropriately as the game grows. 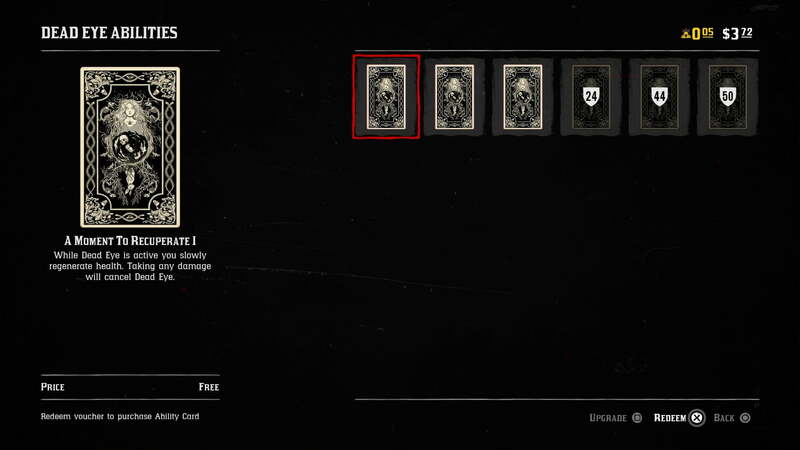 As you play and increase your rank, you can purchase ability cards that tweak key gameplay elements like Dead Eye. I do think Red Dead Online could stand to be a tad more liberal with its mission rewards, but it’s far too early to tell if the slow accumulation of funds will be a problem in the long run.